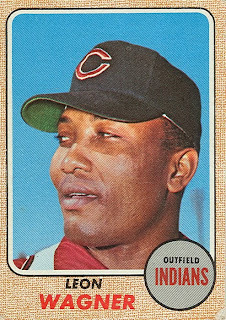 Leon "Daddy Wags" Wagner was the power-hitting left fielder of the expansion Angels (and later the Cleveland Indians) who, once the calendar struck 1968, couldn't buy a home run. Wagner played one season for the Tuskeegee University baseball team in 1953, then was signed by the New York Giants in 1954. He played 3 seasons in the Giant's system before missing the 1957 season while in military service. In 1958, he divided his time evenly between San Francisco and the minors, making his major-league debut on June 22nd. He and Hank Sauer shared playing time in left field. In 1959 he played a full season for the Giants, but was 3rd on the left field depth chart behind Jackie Brandt and Orlando Cepeda. 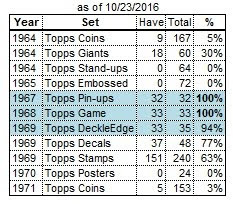 (Although Cepeda was the #1 first baseman, he played a lot of left field to make room for Willie McCovey at 1B). After the season, Wagner was traded to the Cardinals. Wagner spent most of the 1960 season in the minors, then was traded to the independent triple-A Toronto Maple Leafs in October. The following April, Toronto traded him to the expansion Los Angeles Angels, where Wagner had a breakout season. Wags hit 28, 37, and 26 homers in his three seasons with the Angels, and was a two-time all-star. In December 1963, the Angels traded him to the Indians for pitcher Barry Latman and first baseman Joe Adcock. Wagner continued his slugging in Cleveland - this time with sidekick Rocky Colavito. In his first 3 seasons he hit 31, 28, and 23 home runs. 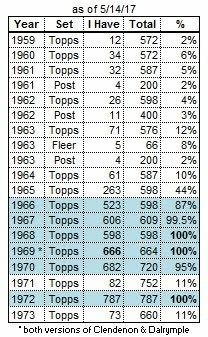 Wags' power started to taper off in 1967, as he only knocked 15 homers. In June 1968 he was traded to the White Sox for outfielder Russ Snyder. In December, Chicago sold him to the Reds, but Cincinnati returned him to the Sox on April 5, 1969. On the same day, he was given his release by the White Sox. 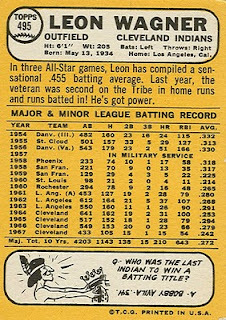 Later that Spring, the Giants signed him for pinch-hitting duties, but he only appeared in 11 games for the Giants. He spent the remainder of 1969, and all of 1970 and 1971 in the minors, before retiring.